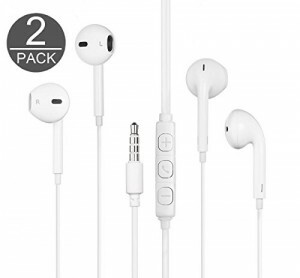 2 earphones and 1 carry case for the earphones, so you can bring these anywhere. Smart phones, Android, tablet and all other compatible devices with 3.5 MM jack. Samsung galaxy Note Edge/ Note 5/ Note 4, Samsung Galaxy S6 Edge plus/ S6/ S5/ S4/ S3, Sony Xperia Ion/ Z/ P/ J/ S/ U/ Tipo Dual/ Miro/ Acro/ Ultra, Htc One.